Alongside our sister company - Architectural Street Furnishings, WB White Foundry manufacture a range of environmentally sustainable street furniture products. Please visit our street furniture website. Although cast iron is one of the oldest materials in engineering, it is seeing something of a rebirth of fortunes in the modern world with regards environmental impact and sustainability. "It breathes air, burns itself up in oxygen and so gives up its own life so that we may live ours." This is based on the fact that Cast Iron does not rust in the traditional sense, it oxidises very slowly. 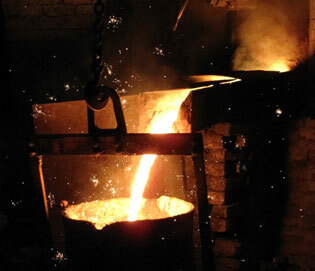 This process gives off iron ashes which are carbon based and good for the environment. They promote green growth on plants and increase planktonic life in the oceans, thus combating global warming. Recent studies have shown that adding iron dust to the oceans could have a dramatic positive effect on their health, increasing the oxygen output of our seas and oceans and reducing greenhouse gasses. On a practical note, this slow oxidisation makes iron very long lasting. Cast Iron is also totally recyclable and recycled, and further to this it can be recycled indefinitely with no decline in properties. WB White Foundry casts from a mixture of recycled steel, largely from the automotive and engineering industries, scrap iron from the automotive industry, and in house returns - meaning that any wastage in the manufacturing process is put back into the furnace and melted to make 'new' iron. The mould making process uses sand as the main material. At WB White Foundry we have a plant to recycle this sand - in the green sand casting process 100% of the sand is recycled and for the furan (air set) sand castings 85% is either reclaimed or recycled. WB White Castings are Raw Material to Finished Product in 20 metres and as UK manufacturers our transport miles to site are kept to a minimum. 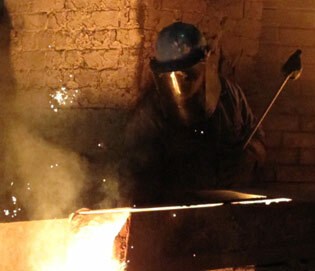 Our Foundry is well inside European and UK emissions regulations, up to and including the year 2012.